If, like me, you are awash in reusable cloth shopping bags, you no longer choose between paper and plastic. It feels good. But, like me, you probably still fill those totes with new plastic packaging at every trip to the store. Isn’t there an alternative? Colin Beavan thought he had figured one out. In his book, No Impact Man, he describes walking to Integral Yoga Natural Foods in New York’s Greenwich Village, his totes loaded with pre- weighed recycled containers for his rice, peanut butter, and other bulk purchases. He goes to check out, expecting admiration and praise. Instead, the cashier sighs and rolls her eyes. It was one of many moments when Beavan asked himself whether his experiments were noble or merely ridiculous. Across the country, though, unbeknownst to Beavan, the Good Food Store in Missoula, Montana, was ready for and in fact two steps ahead of him. 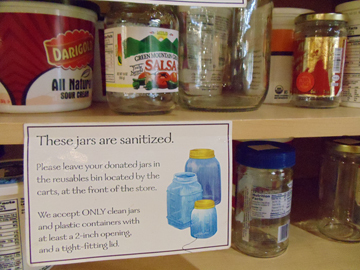 For some years, the Good Food Store has not only has encouraged customers to bring in used jars and containers, but even made it into a convenience. Drop your containers into a special bin and the store will sort and sterilize them, mark them with their packaging weight, and arrange them on a shelf for other shoppers to use (see photo above). Is this simple practice scalable to our nation’s largest grocers? A Whole Foods representative tells me no. He points to local health codes that prohibit the use of reusable containers. The fear is that contaminants might transfer from the mouth of a container to the spout of a bulk bin. Presumably, even if Whole Foods sterilized donated containers, it could not guarantee that cracks in the containers weren’t harboring pathogens. In what may be an inconsistent policy, however, the representative says that Whole Foods customers are welcome to bring in used plastic and paper bags for their bulk goods purchases. "In what may be an inconsistent policy, the representative says that Whole Foods customers are welcome to bring in used plastic and paper bags for their bulk goods purchases." I called my own city health department in Columbia, Missouri, for the low down. The inspector said that nothing in our local food codes explicitly addresses any of this, but only because it hasn’t come up. Instead of calling the State, I simply biked down to Clover’s Natural Market with three big yogurt containers and a couple of glass jars. (Tip: The lightweight clamshell packages aren’t as useful—the ones I had originally intended to bring warped in the dishwasher.) The yogurt manufacturer, Nancy’s, had even provided a space on each container for me to mark with a re-purpose. I handed my containers to the long-haired cashier and asked him if he could mark them with the packaging’s weight (known as the “tare” weight). “Uh, sure,” he said. After conferring with a colleague, he figured out how to note the tare and how it would be discounted upon checkout. Clearly this doesn’t happen every day at Clover’s, but nobody rolled their eyes. In fact, they were very sweet about it. There may be some health risks associated with reusing containers, but surely they pale in comparison to many practices that are allowable and even encouraged in our food stream (including using canvas shopping bags, which most people wash infrequently). My advice: You already reuse tote bags… why not reuse containers, too? Let the health codes catch up after this becomes common practice. For more ideas about reducing packaging in our food stream, check out the Plastic-Free Guide and this complaint about Trader Joe’s packaging practices. Jake Giessman is a teacher in Columbia, Missouri, and a guest blogger for New Dream.